We’d love your help. Let us know what’s wrong with this preview of Somebody to Love by Merry Farmer. For Phineas Bell, love has not only been out of reach, it has been impossible. In a world where men who love other men are anathema, he has poured his love into his work, his town, and the friends who accept him as family. But when a handsome new lodger takes over his home and his heart, breaking all his careful rules, Phin must choose between playing it safe and letting l For Phineas Bell, love has not only been out of reach, it has been impossible. In a world where men who love other men are anathema, he has poured his love into his work, his town, and the friends who accept him as family. But when a handsome new lodger takes over his home and his heart, breaking all his careful rules, Phin must choose between playing it safe and letting love in. To ask other readers questions about Somebody to Love, please sign up. This may be one of my toughest reviews. Was this story technically written well, yes. No grammar issues and no typos that I recall, the story moved along at nice pace. But did I care for the characters relationship, not so much. Also, when I started this book I was surprised to see it takes place in 1900. There is no indication in the blurb that it was Historical. I like Historical stories but found this information should be included in the Book’s description. We meet Phineas “Phin”, the local Bank owner in Cold Springs Montana. I liked Phineas. Phin is smart, honest, trustworthy and loyal. The town loves him. He has no contact with his own family, however, he is surrounded by the family of his best friend Michael West, his wife Charlotte and their 3 children. I enjoyed this part of the story with Phin and the West family. Phin is a gay man who can’t live his true life as he should but he has accepted that and built a pretty nice life for himself. Then we meet Elliot Tucker. He is a war hero and Cold Springs’ new Sheriff and I instantly did not care for him. He is described as gorgeous with a friendly personality. However, I found his character dishonest, manipulative and immature. It’s not easy to love a romance story when you don’t care for 50% of the couple. Most of the story revolves around Elliot and Phin being attracted to one another, but then it went in a direction that had Elliott lying and using the local women to hide his attraction to Phin. The kind and honest Phineas was not happy about this and asked Elliot to stop tricking the women which he does not. Phin and Elliot did not mesh for me as a couple. I think Elliot was suppose to come across as the “Hot Alpha” male but failed. They argued often and Phin obviously didn’t care for Elliot’s lying ways. However, that didn’t stop Elliot from insta-love. And when Phin didn’t declare his love right back Elliot threw a bit of a tantrum. I found it very difficult to root for this couple. As the story progressed, we learn there is a criminal element. At this point I hoped Elliot would win me over considering he is the local Sheriff and could shine here and show some skills. That did not happen. When the kidnapping takes place, the first words Elliot says to Phineas are “what do we do?” Wait, what? Did the local Sheriff just ask the local Banker what to do when a child is kidnapped before their eyes? Yes he did. The author had a great opportunity at this point to “show” us what Elliott is made of but sadly that did not happen. We are “told” he is war hero and Sheriff but his actions are the complete opposite. The story then moves toward solving the crime, enter the federal “keystone cops”. There is a lot going on at this point of the story, not just the kidnapping. We have counterfeit money, blackmail, abusive cops who break the law and Elliot complaining to Phin that he doesn’t love him back. Phin is heartbroken about the kidnapping but this does not stop Elliot from pursuing Phin even while they are hot on the trail of the kidnappers. Eventually they rescue the child and Phin declares his love to Elliott. On the positive side, I did enjoy Phineas. He has a great relationship with the West family as well as the town and that part of the story was done well. As I said above, this was a difficult review because I did enjoy some of the story but my lack of Elliott love outweighed the rest. The story had the potential for awesomeness. With the right character traits from Elliott, he and Phin would have knocked it out of the park, but sadly, Elliott was not written that way and I was left feeling that Phineas settled. As the title says, Phin found Somebody to Love, and Elliott was somebody. Somebody to Love is the sixth book in the Montana Romance series by Merry Farmer. The book takes place at the turn of the century: The Industrial Revolution is in full swing, technology is changing, and admitting to being a homosexual could get you killed. Sheriff Elliot Tucker knows how homosexuals are looked down on in society, from experience. He has built a fortress around himself to hide that part of him. Thanks to the classification of being a war hero, Elliot believes that he is safe from people’s prejudices. To the world, he presents the façade of a stereotypical alpha male. He is vain, cocky and very full of himself. Phin is a gentle man, who has a depth and compassion to him that is slowly revealed to both readers and Elliot. Phin’s honesty is both a positive attribute and a fault. Family and friends are important to Phin as is being honest. He does not hide who he is from the townspeople, and he does not use people as cloaks, unlike Elliot. Although the townspeople do taunt Phin, they also seem to afford him respect, which is a bit lost to Elliot at the beginning of the book. The fact that this story is set in 1900 in a small, western town adds intrigue and charm to the characters and the plot. Farmer has written an engaging story that draws the reader in from the beginning. The characters in the book are multi-dimensional, and even without having read any other books in the series, readers will appreciate the charisma of these characters and their connection to each other. Both the romance and mystery of this story vie for center stage in the plot: corruption, kidnapping, criminal enterprise, a dramatic fire and a well-timed bar brawl all have the power to keep readers on the edge of their seats. Farmer’s prose are beautiful and descriptive. The town of Cold Springs is welcoming and aptly a direct contrast to the barrenness represented by the mining town of Anaconda. Farmer uses irony, symbolism and humor in an appealing fashion within the pages of this story. The dialogue works well in this story and helps deepen both the plot and characters, even though it may not be one hundred percent authentic for the time period. Somebody to Love by Merry Farmer! Love has not come easy for Phineas and sometimes near impossible. He lives in a world where loving another man is completely forbidden and not acceptable by any means. So he has lived his life through his work and the family and friends who accept him for just being himself. Now enters a gorgeous lodger who enters his life but more importantly his heart. He must now choose between the comfort of a secure and safe life or risk it all for th Actual 4.5 Star Review! Love has not come easy for Phineas and sometimes near impossible. He lives in a world where loving another man is completely forbidden and not acceptable by any means. So he has lived his life through his work and the family and friends who accept him for just being himself. Now enters a gorgeous lodger who enters his life but more importantly his heart. He must now choose between the comfort of a secure and safe life or risk it all for the love he has never had before. Elliott is the new sheriff in Cold Springs, Montana and every women wants him as he is simply gorgeous but for Elliott he only has eyes for Phin. The chemistry between these guys is so hot and steamy but Elliott has his hands full trying to break open Phin's heart and let him love him for the man he is. Now an abduction brings both men together on a hunt for the cold blooded kidnappers. Will their attempt to save the missing child bring them together or pull them apart? This is another book in the Montana series and is a stand alone novel. I so enjoyed the characters and how beautifully written they were. I loved how Elliott had to work at getting Phin's love as he spent so many years alone. So this was not a jump in the sack story but one of true love and understanding and why these two men so belong together. From the beginning you will be rooting for Phin to find the love he so desperately deserves. Then add in a great sub-plot involving an abduction and what a great and brilliantly written piece of writing. This is such an amazing historical gay western romance book set in 1900. I truly love this genre and the author was so detailed and spot on in her writing of this time, that I found myself being portalled back in time. This was my first novel by this author and I found myself loving her story so much and I will definitely be reading more of her work. 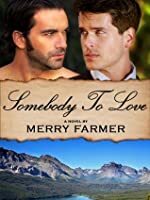 So I recommend this novel...Somebody To Love by Merry Farmer for anyone who loves a good gay romance story, hot men, drama, acceptance and LOVE! This was a solid three star read. The pacing of the novel was well done, especially toward the end where the edge of my seat climax was worth waiting for, and the writing flowed easily. Somebody To Love is the story about the romance of Phin(eas) Bell and Elliott Tucker, infused with a bit of mystery and suspense. It's an easy read, apparently well-researched and seemingly indicative of the time period, specifically as far as the relationship between the two men is concerned. While I came to care This was a solid three star read. The pacing of the novel was well done, especially toward the end where the edge of my seat climax was worth waiting for, and the writing flowed easily. While I came to care about Phin, who seemed a nicely, unassuming and kind man, I couldn't care so much about Elliott. He grew on me at the end, but I wasn't fond of his deception and assumptions, and his jealousy didn't suit him well at all, especially considering that he instigated that which he then came to hate. Meh. From what I understand, this is book 6 in a series, but required no knowledge or background on the previous books, as all required information was seamlessly integrated into the story without feeling like info-dump. I loved that Phin had some backbone, and that his meekness and kindheartedness didn't mean that he was weak. He cared a great deal about his 'niece' and the people in his town, but was deathly afraid that someone would find out his secret, even though the people close to him knew that he wasn't a 'normal' man. I did like that Elliott pulled his head out of his a$$ at the end, and understood that the charade had to continue to some extent. How many men lived their lives as "confirmed bachelors" but were secretly in love and in a relationship with their "roommate"? And how happy am I that we no longer live in a time, at least in this country, where good people have to hide whom they love? As my first exposure to this author, this was a success. Nicely done, Ms. Farmer. This is another book in the Montana series & this time finally we have the much awaited Phineas Bell's story . If you've read the other books in this series , you'll know these are set in the town of Cold Springs ,Montana. Phineas is a banker & owns the bank in town. Phineas is a gay man but has been resigned to celibacy as a confirmed bachelor for quite a number of years and when a new sheriff, Elliot Tucker arrives in town , things change for Phin & they find themselves drawn to ea This is another book in the Montana series & this time finally we have the much awaited Phineas Bell's story . If you've read the other books in this series , you'll know these are set in the town of Cold Springs ,Montana. Phineas is a banker & owns the bank in town. Phineas is a gay man but has been resigned to celibacy as a confirmed bachelor for quite a number of years and when a new sheriff, Elliot Tucker arrives in town , things change for Phin & they find themselves drawn to each other on first meeting , maybe this could be Phin's time to have his own Happy Ever After & get 'somebody to love '. I was thrilled to find this book - it's not often a regular romance writer both gives a gay character an important role in their books, much less moves on to give that character a starring place in their own book with an honest to goodness romance of their own. I really wanted to like it. Unfortunately, compared to the first book of the series which is what hooked me on this author, it falls flat. I spent half the time wanting to shake Phin and punch Elliot, and the endless misunderstandings they I was thrilled to find this book - it's not often a regular romance writer both gives a gay character an important role in their books, much less moves on to give that character a starring place in their own book with an honest to goodness romance of their own. I really wanted to like it. More like 2.5. Slow, story dragged. No chemistry between H/H. You need to be open-minded to enjoy this story. It is spicy and about a gay relationship. I have read much of this author’s work and enjoyed it. It is both a romance and an adventure. 16 grammar errors in a book with three people thanked for editing? Nice Queen reference in the title. I did enjoy this, quite a lot, but it didn’t hold my interest as I felt perhaps it should have for the historical placing of the story. From my review: "Somebody to Love is similar in my mind to a m/m "Paint Your Wagon" sort of story. Part of it made no sense, likewise the casting. Parts of it were fun, absolutely enjoyable while others were, well, lets be kind and just say perplexing. But not every reader will feel as I do and for some, this journey into 1901 Montana and a Cold Springs romance might just be the thing for them. It's all in how you approach historical fiction and your tastes might vary from mine." This was a good reads giveaway that I won. I wanted to like this book, but I couldn't. It took me forever to finish, because I wasn't excited to get back into it. The story was alright, but it needed more somehow. I liked that it was a difficult subject. Gay men in that time period were shunned. The book to me didn't have enough romance. Or I guess I wasn't feeling it. There also was some typos, I think one even in the back of the book. Sorry to give a bad review. But it's only one opinion. If you This was a good reads giveaway that I won. Read my first LGBT romance novel; and it was pretty awesome. Loved how this book danced past some of the "he's the feminine" and "he's the masculine" hues that I expected to read; they really are incredibly developed characters! Still loved the cast of characters! Definitely recommend reading this series in order! Highly recommend Farmer to y'all; love her writing style. He plot actions are concise and easy to follow, a delightful read. Phin(eas) Bell is a gentle man who has compassion and his honesty is both a positive attribute and a fault. Sheriff Elliot Tucker is vain, cocky and very full of himself. He presents the façade of a stereotypical alpha male. He knows how homosexuals are looked down on in society, from experience. But Phin had my heart as well as my attention. Merry Farmer is a bestselling, award-winning novelist who lives in suburban Philadelphia with her two cats, Torpedo, her grumpy old man, and Justine, the new, feisty baby. She has been writing since she was ten years old and realized one day that she didn't have to wait for the teacher to assign a creative writing project to write something. It was the best day of her life. She then went on to ear Merry Farmer is a bestselling, award-winning novelist who lives in suburban Philadelphia with her two cats, Torpedo, her grumpy old man, and Justine, the new, feisty baby. She has been writing since she was ten years old and realized one day that she didn't have to wait for the teacher to assign a creative writing project to write something. It was the best day of her life. She then went on to earn not one but two degrees in History so that she would always have something to write about. Her books have topped the Amazon and iBooks charts, and been named as finalists in the prestigious RONE and Rom Com Reader’s Crown awards.